What do you get when you mix fast heavy planes with small island airports? A hair-raising final approach! Let’s take a look at three scariest airports to fly into in the Caribbean. Passengers arriving into Princess Juliana often fly just a few metres over the head of sunbathers below on Maho Beach. The combination of screaming jet aircraft and beautiful tropical scenery in such close proximity make this airport a mecca for the world’s plane spotters. In fact, check out this video showing the arrival of a 747, shot by yours truly on a 2004 trip. Arrival isn’t the only exciting part of this airport either; departing aircraft must make an immediate right hand turn to avoid flying directly into the 317 m St. Peter Hill. At the same time, the departing planes blow a massive amount of jet blast back onto Maho Beach – so strong is the blast that it can cause you and your belongings to be blown right into the water if you’re not careful. This small airstrip is aligned east/west between the beach at St. Jean and a steep hill west of the airfield. Arriving aircraft have to fly very low to the ground and then descend rapidly down the side of an extremely steep hill to make the field. 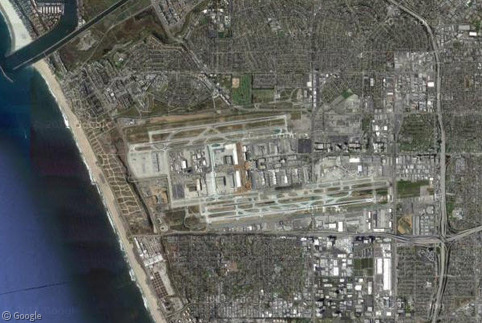 To make matters worse, the top of the hill has a traffic circle and the airfield itself is very short! Take a look at this picture to see how tight the approach really is. Built on the side of a potentially active volcano, Saba is home to the smallest commercial runway in the world. Juancho E. Yrausquin Airport’s single runway is only 396 m (1,300 ft) long, making the field totally inaccessible to anything but small aircraft flown by specially trained pilots, and helicopters. To make matters worse, the ends of the runway drop 18 m (60 ft) off a vertical cliff into the ocean, while the side of the strip is covered in high hills. To book a trip to any of these airports, use the three letter airport code next to the name. The weather’s great all year round! Saba is one of those places where if you actually know what’s going on outside the airplane, you probably hold your breath for the landing. It’s intense. I could see it from the airplane when we left St Maarten. It just looks like a big rock in the middle of the ocean! I love the way the nosewheel taxi-marking goes straight off the edge of the cliff at Saba. That pilot was flaring out over nothing before touchdown, one downdraft and he’d have been into the cliff. Other good ones on the same theme are Gibraltar (where the only road out of town crosses the middle of the runway) and the Arran Islands. I’m going to mention Gibraltar in a future article. It’s really unique how that airport is laid out. That Arran Islands airport looks quite a bit like Saba! Thanks for posting! Just to be clear: Those are the Aran Islands. Arran is an island off the coast of Scotland. All you can see out of the window on approach is water… until the very last minute. I’ve got to go to that beach on St Maarten though! Wow I’m surprised they found enough room for the airstrip there in Male! Nice post! BTW – St Maarten is awesome without the airplanes. You can just sit on Maho Beach all day and drink El Presidente’s (sp?) and watch the sun go down over the water. It’s such a neat place. Here’s Los Roques, but sadly the imagery is too low-resolution to find the airstrip. The runway at Grise Fiord, NU, Canada 76 25’N / 82 54’W is short and gravel, and there is a full 90 degree left hand turn during final. The landing lights mark the turn. To land, one flies right at the face of the cliff behind the town, and then turns at the last moment. The only plane that could do it 25 years ago was the De Havilland Twin Otter. In winter we carved a mile-long ice strip on the sea ice out in front of the town. They would land a Hercules or a 737 on 6 feet of sea ice. I was taught in the military you could get a loaded Herky down in 300m, and off again unloaded in the same distance. The pilots used to demonstrate doing it in 100m, but they were unloaded. I haven’t seen this one myself (which is why I omitted it from my first posting), but they used reckon Salzburg was one of the more hairy commercial airports – there are some big mountains on the southern end of the runway in particular, but for me they look avoidable even for the heavies. The Swiss have runways all over the place, some of which have dispersal built straight into the mountainside entirely deliberately, as they spent the 1950s and 1960s burying all thier military bases under the mountains, much like Cheyenne but on a systematic scale. Now you know what Swiss cheese was a prototype for ;). Also go hunt some of the North Korean postings a couple of years ago here. Yea the Swiss deserve their own post when it comes to hairy airports. Thanks for the info. Alan, do you mean this only vaguely flat-ish strip of gravel? EDIT: I’ve edited your post to include the link. This small strip of gravel is indeed the Grise Fiord airport. It is actually flat, although the terrain implementation in Google Earth gives it a hump at one end. I fly into Grise Fiord all the time in Google Earth Flight Simulator, using a joystick for the ultimate flight sim experience. Sometimes I come through the mountain path at he other end of the strip (I have flown through that way in a Twin Otter – as a passenger – when the winds were absolutely the wrong way). GE Flight Sim with a joystick controller is an absolute delight. I have been flying into some of the Caribbean airports mentioned in this blog and some would be truly terrifying in real time . . . The airport at Union Island, an Island that belongs to St.Vincent, although have not been there for a few years was scary. Plane comes over a large hill and has to come down quickly to a small strip which ends at the sea. Pilots had to time it with accuracy. The now closed Kai Tak airport in Hong Kong also had an amazing landing. Pilots flew straight towards a rock faced hillside on one approach beam. (That hillside was helpfully painted in a white and International Orange checkerboard pattern.) At the last minute, they would pick up a second beam to their right, and would turn hard over to land. This video gives you an idea of what it was like. Numerous other videos can be found on YouTube, etc. Sitting in a starboard window seat, those rooftops looked a whole lot closer to the wing tip than in the video. You would swear the plane was going to pick some laundry off the roof top clotheslines. Kai Tak is legendary for airplane nerds. It’s a shame it was ripped up. Although the new Hong Kong airport is an engineering marvel in its own right. 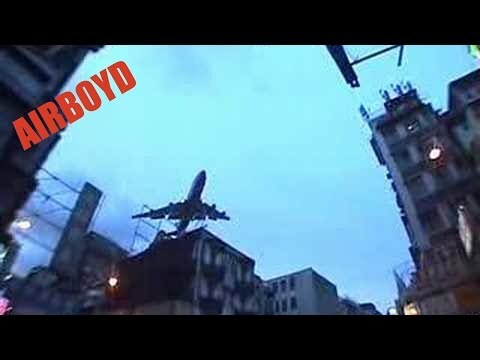 @qka – I clicked through from your first video to watch another from Kai Tak where the pilot does a pretty incredible recovery after overshooting the runway during a crosswinds landing. Try Union Island or Carriacou. Union is similar to St Barths with a long corkscrew landing necessary. Watch out for cows on the runway in Carriacou. Lukla – in Nepal is the very scary airport and is certainly deserving to be among any 5 scariest you could name. You land going uphill and take off going downhill! Seconded on Lukla, now the only runway with landing markings at one end only because the other end is a mountain. A go-round there’d be like 633 Squadron! And that doesn’t mention the 700m drop at the other end.